Chevron Corp. announced last week that it was buying Anadarko Petroleum in $33.0 billion stock-and-cash deal. The deal is big news for investors, as it significantly enhances Chevron's value proposition. The transaction is expected to yield $2.0 billion in synergies and is accretive to earnings and free cash flow. The addition of Permian, Gulf of Mexico and LNG assets presents an opportunity for Chevron to grow cash flow going forward. An investment in Chevron yields 4.0 percent. Big news was reported by Chevron Corporation (CVX) last week when the energy company said that it would acquire all of the outstanding shares of Anadarko Petroleum Corporation (APC) in a deal worth $33.0 billion. The transaction is a big deal for Chevron's shareholders because the acquisition adds to the company's core strengths and points to production and free cash flow growth going forward. Chevron said on Friday that it would acquire Anadarko Petroleum in a stock-and-cash deal that values the shale company at $65/share (reflecting a deal premium of ~39 percent). Anadarko Petroleum's share price surged 32 percent on Friday and closed at $61.78, below the proposed transaction price. As far as the transaction terms are concerned, the deal will be executed as a stock-and-cash deal, with the majority of the consideration coming in the form of Chevron stock (75 percent) and the remainder (25 percent) in cash. 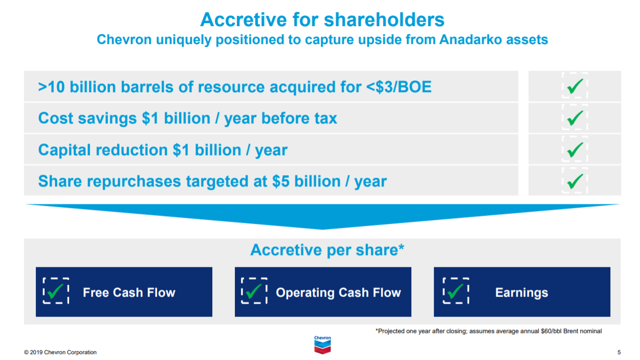 The acquisition is expected to be accretive to Chevron's operating cash flow, free cash flow, and earnings. In addition, Chevron expects to lift $2 billion annually in synergies from the acquisition, starting one year after the transaction closes. The proposed transaction does not only have financial benefits for Chevron but also makes strategic sense for the company because it plays to its core strengths and will support production growth. Acquiring Anadarko Petroleum's assets will strengthen Chevron's position in the fast-growing Permian shale theater and expand its high-margin deepwater drilling capacities in the Gulf of Mexico. In addition, Anadarko Petroleum's Mozambique LNG project will be a good fit for Chevron's existing LNG platform. In my last article on Chevron, titled "Chevron Corp.: This 4.0%-Yielding Top-Notch Energy Company Just Raised Its Dividend By 6.3%", I recommended the energy company for investors because of its strong value proposition and dividend growth in both good and bad times: Chevron has consistently grown its dividend payout during the last energy bear market from 2014 to 2016, which is a property of a high-quality income vehicle. The company also raised its quarterly cash dividend in January from $1.12/share to $1.19/share, marking an increase of 6.3 percent. 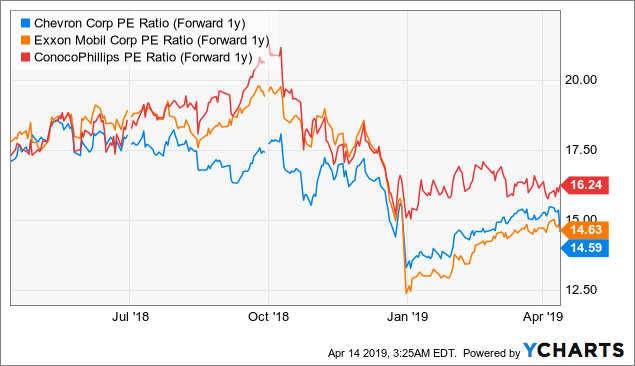 The proposed acquisition of Anadarko Petroleum points to (free) cash flow growth a year after the transaction closes, though the energy company has not yet provided a specific guidance. In any case, increased exposure to the Permian theater and an enhanced LNG resource base would further support Chevron's generation of excess cash that can be used to grow its dividend and buy back stock. The company has said that due to expected FCF growth related to the acquisition, it plans to increase its stock buybacks from $4 billion to $5 billion annually after the transaction closes. Chevron's share price dropped off after the transaction was announced, which is nothing unusual: the acquirer's share price often drops after a transaction announcement due to the fact that the acquiring company frequently pays a significant premium in order to gain control of the target's assets. Chevron's shares dropped 4.94 percent on Friday. Today, Chevron's shares sell for 14.6x next year's estimated profits, which is the lowest forward earnings multiple in its peer group. 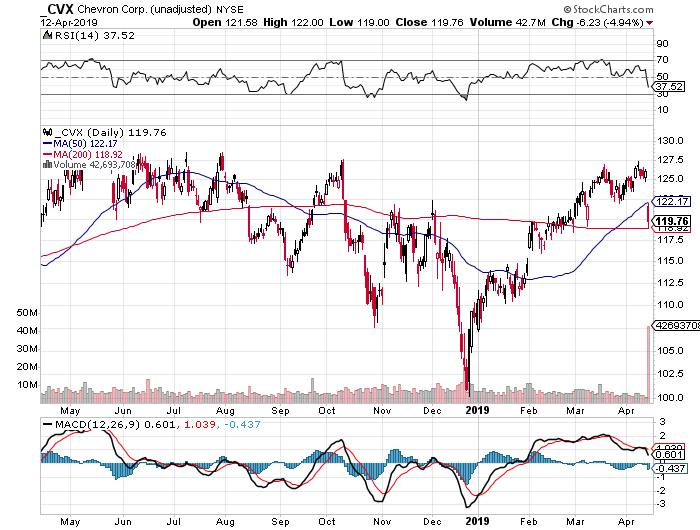 However, the company's earnings and cash flow are likely going to get a boost if the transaction closes, which improves CVX's value proposition even more. The transaction may not close in case shareholders don't approve the transaction, which is quite unlikely, in my opinion. A major price crash similar to the 2014 market downturn could negatively affect the value proposition here and invalidate the deal economics. A continued rebound in price realizations, however, supports the investment thesis, as higher prices immediately benefit companies that have sizable upstream businesses, like Chevron. 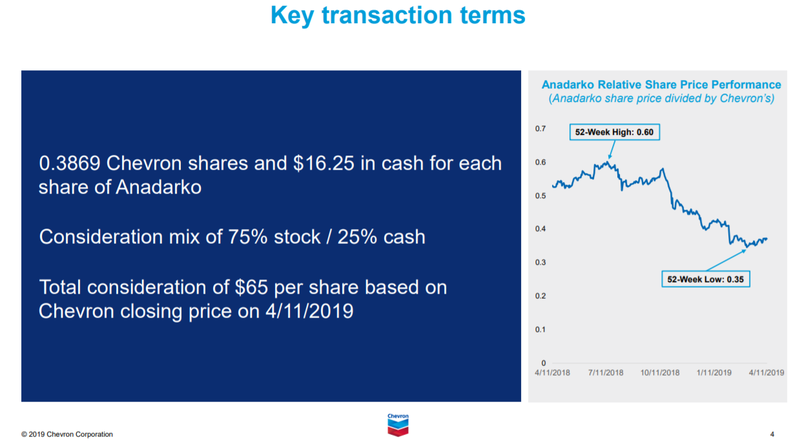 The acquisition of Anadarko Petroleum is not a game changer for Chevron, but the deal economics look good and are attractive for shareholders. If the transaction closes, Chevron has earnings and (free) cash flow upside that could trigger a reevaluation of the company's value proposition by the market. Chevron will also buy back more stock and has a real shot of growing its dividend at a fast clip going forward. Strong Buy for income and capital appreciation. Disclosure: I am/we are long XOM, COP. I wrote this article myself, and it expresses my own opinions. I am not receiving compensation for it (other than from Seeking Alpha). I have no business relationship with any company whose stock is mentioned in this article.